The best way to see the spectacular views of modern Dubai! With this tour, you will be able to capture amazing views of all attractions and landmarks around UAE. You will enter in Palm Island with us where huge buildings and villas will give you stunning views. 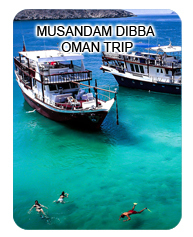 Time that you will have with us will make every moment precious for you and your pleasant trip will start from Urban Marina while enjoying the soothing waters of Arabian Ocean. 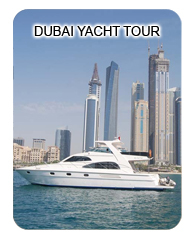 We will cover Persian Gulf shoreline that will make your tour a delightful cruising experience you ever enjoyed. Whether you are tourist or are with us to enjoy your celebrations, you will get all what you want for fun. Irradiated lights on seashore of Dubai Marina residences are waiting for your arrival. Aside from this beautiful and fascinating scene, the water path of the Marina Mall and the Yacht Club will give you stunning views and feel of comfort and relaxation. For making your cruising experience enjoyable and amazed, delicious supper is ready to serve you with complimentary drinks. 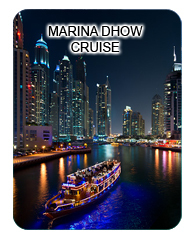 You will enjoy stunning views of water path and you will enjoy stunning views of silver prepared sky on our Dhow Cruise Marina. Come and join us! Enjoy smooth sailing along the creek as night falls with spectacular glittering views of stunning building reflections in the waters. Devour all this whilst listening to relaxingly romantic Arabic and English music.